Texas Tales: I give it a ten! That's how much dinner I ate the other night. And goodNESS, it was good! Fresh off the heels of the Partida Tequila dinner, Yelapa Chef Wiley put his culinary skills to work once again for a seated event at Ralph Smith Photography studio. The theme? A farewell to stone fruits. You know, all those pitted items like peaches, nectarines and plums? Well, they're almost outta here as fall rolls around so it was time to make the most of 'em and eat, eat, eat! Ralph Smith's spacious photography studio was a gorgeous setting. The courtyard where most of Smith's events are held, weather permitting. A perfect backdrop for dinner! For lack of a better approach - because, let's face it, a picture is worth a thousand words - allow me to take you on a visual culinary journey through our 3.5 hour food foray. Our second course nearly completely escaped my camera, but not my mouth, as I savored littleneck clams in plum wine and pork cheek with a crisp Nigori sake. Fourth on the list was a delicious take on quail with green tea, nori, peach jam and orange Fanta. 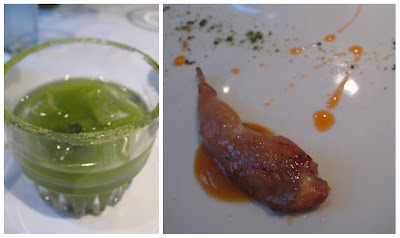 This came with my absolute favorite cocktail of the evening, a green tea vodka mojito (rimmed in green tea powder). I must learn how to make these!!! 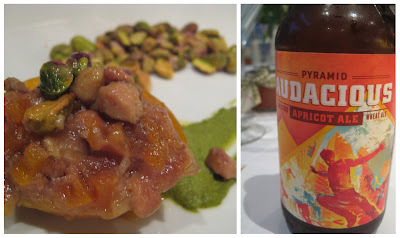 The next, and fifth course, involved a foie gras-stuffed apricot and pistachios, which was served with a yummy Pyramid apricot ale. 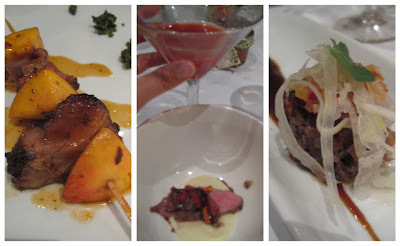 Courses 6, 7 and 8 were nice and meaty and included pork souvlaki with nectarine and coarse Greek pesto; lamb with cherries, coke and Mexican marigold, plus a sour cherry Manhattan; and oxtail with plum, jus and fennel, respectively. By this point, we were getting very full. 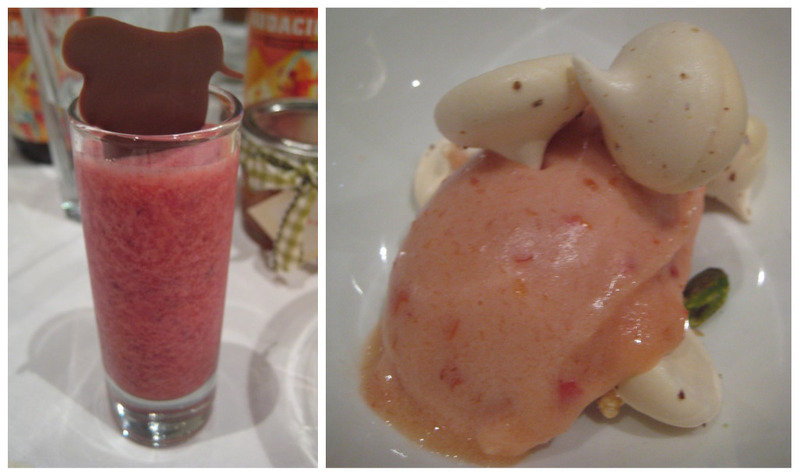 But there were three dessert courses to go! On the menu was a delectable peach sorbet with szechuan merengue, as well as a poached plum financier (popular in France, we were told) with ginger and muscat, and a blended mignardises with cherry and a spot of chocolate. With that, we were popping our own buttons and reclined in our seats groaning in delightful agony. 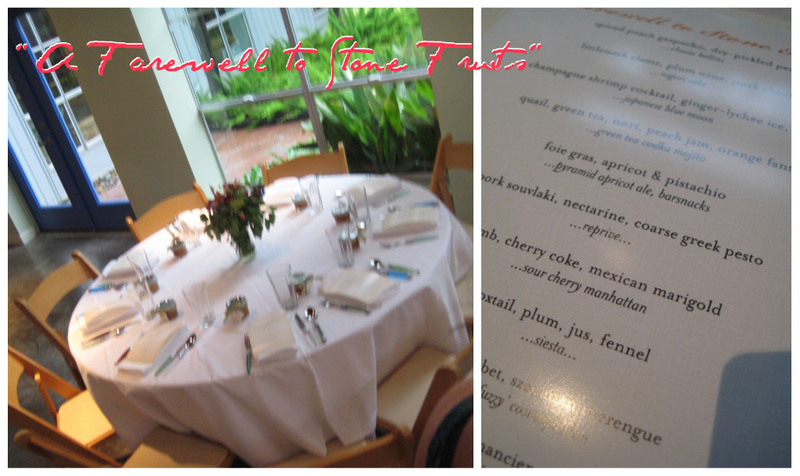 What an amazing dining experience! The night wouldn't have been complete for many without the totally roastin' coffee bar by Java Pura. And Chef Wiley whipped up homemade peach jam as favors for all the guests. This one certainly made it in my book as a top-notch, ten-course success!!! Nice write-up with pictures Amber! I'm glad you could make it. It was an amazing dinner indeed! What an awesome dining experience! Well said, Amber! And what a night it was!